In a scene resembling an Islamist version of the post-apocalyptic film "Mad Max," dozens of kaffiyeh-covered young men ride into the heart of Egypt's Sinai Peninsula on motorcycles and in the beds of pickup trucks into El-Arish. Although they may not be there to pillage and plunder, the al-Qaida flag waved by one militant heralds a dangerous new development. The video was posted on YouTube last week and followed by a statement Tuesday from a group claiming to be the newest branch of al-Qaida. The statement said that al-Qaida of the Sinai Peninsula promised to transform the dusty backwater of the Sinai into a new Islamic Emirate. It also called for Islam to be the only source of legislation in its new state, and demanded that Egypt's military revoke agreements signed with Israel. The group also demanded military support for its brethren in the Gaza Strip, where al-Qaida inspired militants have pushed for harsher application of Islamic law and open war with Israel. The statement and the video seemed to contradict claims issued days before by the governor of the North Sinai province, that Sinai was al-Qaida free. "El-Sayed Abdelwahab Mabrouk denied on Tuesday any presence of Al-Qaeda militants in Sinai, he also acknowledged that a group that calls itself Al-Qaeda of the Sinai Peninsula has spread calls for Islamisation throughout the Sinai town of Arish," reported state owned Egyptian paper Al-Ahram. Mosques in El-Arish received demands that Sinai be recognized as an independent Islamic state following recent clashes between gunmen and police, the paper reported. The same militants are suspected of blowing up a natural gas pipeline to Israel, which represents a rare symbol of economic cooperation in the cold peace between Egypt and its Jewish neighbor. Mabrouk may be right in saying that the militants aren't really al-Qaida. An official statement from the al-Qaida branch has not appeared on popular jihadi forums like Hanein.info, which instead posted news stories about the group from Arabic media. 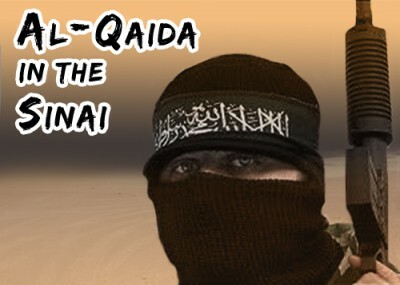 A post on Ansar al-Mujahideen English Forum, an up-to-date and well-known forum for English-speaking jihadists, stated that the new group was simply the "Youth of Islam," following the title given to them in their YouTube video post. There has been no recognition of the new branch from al-Qaida's central division in Pakistan and Afghanistan. Where al-Qaida affiliates have typically been formed by senior militants who fought with the core leadership, as was the case with al-Shabaab in Somalia and AQAP in Yemen, there are few signs that the Sinai branch has the credentials to claim a legitimate connection. But the lack of any formal membership in al-Qaida may have little effect on the group's potential for terrorism against Westerners, Israelis, and even Egyptians. With as many as 400 members, according to Egyptian daily al-Hayyat, the group has already carried out "a number of attacks against [Egyptian] security forces in the Sinai city of El Arish." Tourism in the region presents the biggest opportunity for the branch to strike Westerners. The Sinai Peninsula has been a popular tourist destination for nationals from Europe and Israel, who enjoyed warm, sandy beaches and friendly locals. Israelis have even ignored travel warnings from their government, and a new study shows that they rank concerns of a hostile reception by locals much higher than the threat of terrorism. Militants from the region have already wreaked economic havoc, targeting a natural gas pipeline to Israel and its Arab neighbors for the fifth time since the beginning of the year. The repeated bombings have disrupted supplies to Israel, Syria, and especially Jordan, which is highly dependent on the supplies for electricity. The Israel Electric Corporation also announced it was forced to pursue other methods to produce electricity, with a price tag of 3-3.5 billion Israeli Shekels [roughly $1 billion U.S.] in emergency funds from the government. The potential for the movement of armed religious fundamentalists between Gaza, the Sinai, and the Arab world also exists. Claiming more than 11,000 members, Gaza's Jund Ansar Allah declared an emirate in the territory in April 2010. While it's unclear if Hamas' suppression of these groups has worked - or merely pushed them underground - Salafist forces remain an annoyance and even a threat to Hamas' rule. A Salafist group was responsible for the murder of Italian Hamas-sympathizer Vittorio Arrigoni in April 2011, which embarrassed Hamas by underlining security gaps and drawing attention to violent Islamists in Gaza. Salafi groups have also tried to break Hamas' ceasefire with Israel, by firing rockets at towns and villages around the Gaza Strip.